Sunday, April 22, 1888 Mild after some rain during night, with number of showers & some sunshine thro' day. Others all at Band of Hope meeting A.M. s-school P.M. & at service again eve. After good nights rest, quite as well self, feeling more like taking exercise if had been pleasant, but at reading & rest with pleasant view from chamber, seeing one boat besides ferry. Monday 23 Quite mild & pleasant again. All appear as well with our folks & occupied much as usual. 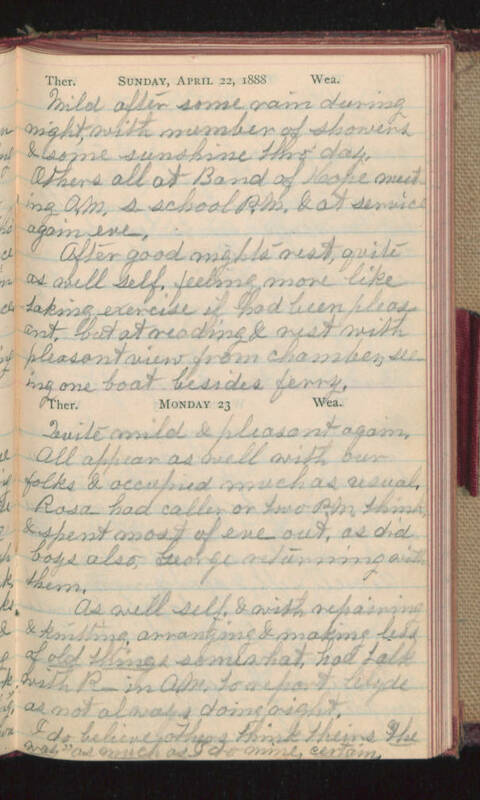 Rosa- had caller or two P.M. think, & spent most of eve out, as did boys also, George returning with them. As well self, & with repairing & knitting. Arranging & making less of old things somewhat, had talk with R- in A.M. to report Clyde as not always doing right. I do believe others think theirs "the way" as much as I do mine, certain.